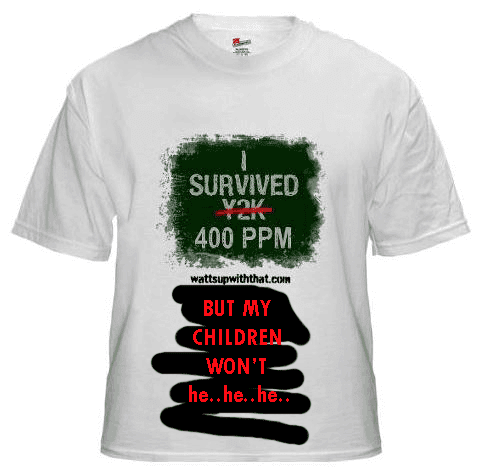 Anthony Watts has a t-shirt for sale, celebrating what deniers think of as success in making Earth more dangerous. According to Anthony's t-shirt they didn't survive Y2K but those who are still around did survive 400 ppm of CO2. I don't know if they'll have the time (or attention span) to improve the t-shirt as I suggested. They are now busy arguing amongst each other over whether one denier camp's 'theory' that the earth is heading for an ice age is better or worse than the other denier camp's theory that the greenhouse effect doesn't exist and "all the physics is wrong" or another camp's theory that global warming is real but 'insignificant' and is caused by thunderstorms or another camp's theory that ENSO has suddenly decided to cause global warming. If someone make your T-shirt, I'll buy one! Brilliant. The T-shirt is absurd. It's one thing to question and be skeptical of science. It's another to revel in anything that climate science regards as concerning. What you say at the end of your post though is what I find most revealing. It seems as though those at WUWT will consider anything but the possibility that global warming will lead to catastrophic climate change. A new ice age is plausible. We'll get warmer, but that will be a good thing. It's being overestimated. All of these are acceptable, the only thing that isn't is the possibility that we should be concerned. You're right. The tie that binds all skepticism is its anti-global warming stance but within their sceptical belief systems they have disparate, contrarian views that are at odds with each other's. The irony that there is no consensus among skeptics escapes them. Putting it into the same mythological genre as their favourite, crackpot sceptical theories, scepticism is like the multi-headed Lernaean Hydra. Each head of the Hydra representing a different viewpoint. And every time a head is cut off? Another two grow in its place as per the Second Labour of Heracles. Going on the duelling egos in the skeptic blogosphere, there's been an awful lot of "head lopping" occurring out there in the aether. The children of the WUWT crowd will probably survive. They are the middle class in the USA, UK and Australia. They might not have it as good as the previous generation, but they will mostly survive. The children of the people who have more important things to do as blogging are more in danger. Yes, I think you have a point. I regularly find WUWT people claiming that the "green agenda" is driving up the cost of energy bills and that this is hitting the poor particularly hard. At the same time, I've found comments complaining about some of the tax on energy bills being used to help those in fuel poverty and being used to insulate homes so as to reduce costs - why should they be paying to reduce other people's fuel bills. It certainly seems that those complaining about the "green agenda" driving up energy costs for the poor, are the same people who feel that taxation should not be used to redistribute wealth.